Innately, we know we cannot escape our circumstances and must face what life throws at us, but on some level, an expat by choice, wants some sort of escape. Maybe it is not a conscious choice (for some it is), but there is a desire to start over, to make anew for whatever reason(s) we each have. After the romance of living abroad settles, lies the dust of reality in the corners of our dream world, unable to be swept under the bed for another day, until we feel like facing our new reality. In the past year, I feel I have equally and diametrically, touched the skies of Heaven and the flames of Hell. 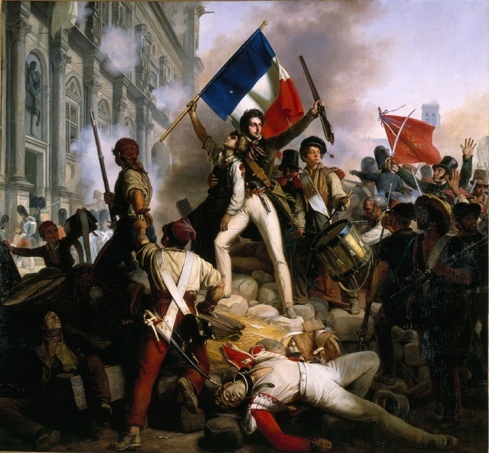 Upon our arrival to England, we had only been unpacked a week before our own, “French Revolution” began. My husband unexpectedly and tragically, lost his mother. ‘Maman’ (mother) was a, ‘femme formidable’ (remarkable woman). Even though she spoke no English and I no French when we first met, we bonded in a way that to this day, I admit I don’t fully understand how. We would play Scrabble together; she would play in French and I in English and when we both would get stuck, we would take a look at each others’ letters for inspiration in the opposite language–yes, we cheated for the greater good, as I like to think! Maman was a mixture of great strength and sadness. During our brief but concentrated time together, I saw the strength, but also the sadness of a soldier who in the end, could not fight any longer. In knowing her, she underscored two important truths: first, we all are fighting something, whether our past, our fear of the future or… (fill in your own blank). Secondly, that place where our fear and insecurity meet, is where true character can be found. I think Maman visited that place more than any of us will know and ultimately, she became too tired to fight another day. She (for me) has set a standard of endurance not many can match, or would want to. She endured for her family, including me…and for that, she will always have my love and respect. Thus began the place were the dust settled in the corners of my new reality and I was forced to look. Still after a year, part of me feels she will be back, that she is just on an extended vacation, perhaps an expat like me. I do hear how ridiculous it sounds, but I can only surmise that I am still working on rationalizing her passing, until I can find a place to put the dust of that reality. My husband and I returned to life as best we could and then, I began to feel unwell. I thought, all the same clichés, ‘well, I’m not getting any younger’ and ‘it must be the stress of moving’ and then…more dust. It wasn’t the change of life or stress, it was in fact, cancer. Life was getting dustier the more I tried to clean it. This could not be ignored until I was ready to accept it, it had to be dealt with now. So we did. I say, ‘we’ because anyone who loves you, has to deal with it too. And so, recently, I underwent six weeks of radiation and chemo. And yes, I believe I saw that place where fear and insecurity meet and I’m still afraid. I’m still working on building my character, still trying to figure out what I’ve gained. I do feel I’ve learned ‘something’, but it’s just that, something. It’s only a feeling of knowing: no instant wisdom, no revelation of understanding yet. I’m still waiting for it all to make sense. But for now, I still want to sweep the dust of the experience under the bed and deal with it later. My body feels like it wants to cry, but my mind won’t let it…yet another revolution (or beginnings of revelation? ).